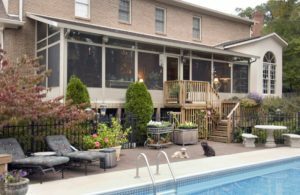 If you want to add a top-of-the-line screen room to your home in or around the Minneapolis, Minnesota, area, look no further than U.S. Patio Systems and Home Remodeling. Our knowledgeable and skilled specialists can help you pick the best enclosure for your home and take care of the installation process from start to finish. • Studio – This classic style screen room is perfect for any home, since it is available in one-wall, two-wall, and three-wall configurations. • Cathedral – A vaulted ceiling will add to the aesthetics of your room and make the space feel extra roomy. After you have your new screen enclosure installed, you’ll be able to enjoy the outdoors like never before. No longer will the harsh sun or biting insects stop you from enjoying your time. You’ll be able to enjoy your new outdoor space even on the hottest of summer days. Plus, in the event you decide you want to upgrade your screen room, our expert technicians can easily convert the space into a sunroom by installing glass panels. To learn more about the screen room selections we have available, contact U.S. Patio Systems and Home Remodeling today.